Jim Aitken carried out dowsing experiments measuring biofields at different places within the complex, and they found this place to have a more marked beneficial effect than most of the other sites they had similarly investigated. Ros Strong, president of the New England Antiquities Research Association, along with Irene Aitken, also carried out some magnetometer readings at the northernmost cairn. Variations in reading were obtained, but as there was intermittent sun, and as the working protocol with the instrument had not been properly designed at that time (the probe may be temperature sensitive and shading was not carried out), it is probably safest not to put too much significance on the results obtained. Moving on, the travelers visited the Findhorn Foundation, and many a richly carved Picktish stone... marvelous carvings left by a lost people. Tantalising, enigmatic images. Aberdeenshire was a revelation. Here are over a hundred recumbent circle sites - stone circles which have a flat or recumbent stone in their circumferences. Some of these lying stones are perfectly horizontal. They form a special archaeological group, and are the only circles that Paul McCartney has to date been unable to tightly correlate with geological faulting. Nevertheless, they may possibly occur only in a region of strong gravity anomaly in a sea of weak negative gravity anomalies (research is pending to check this out in detail). They certainly occur in a landscape that flutters between positive and negative magnetic zones, a little reminiscent of Callanish though not so precisely local. The circles tend to be in good condition, and can visually pop out of the landscape and surprise the traveler. We visited the circle at Castle Frazer, as Michell had noted a map alignment of standing stones onto the site some years previously; a pattern similar to the alignments-onto-stone-circles he had uncovered amidst the old stones of Land's End many hundreds of miles away. Bob Forrest had found the Castle Frazer line to be statistically sound (better than 0.01% in fact - see TLH 87); even with the new upgraded statistical procedures (see TLH 100), Forrest reckons it may still show up as sound. Ros Strong conducted magnetic measurements on top of the recumbent stone, with the transducer shaded, and some variations (either in strength or movement of the ambient geomagnetic field - the instrument does not differentiate which) were noted. But the kindest site to us in all the trip was the recumbent circle known as Loanhead of Daviot (NJ 748 288). This circle, located near the village of Daviot on a levelled site on top of a gentle but conspicuous hill, tentatively dated to around 2400 BC, contains a massive, split recumbent stone. Inside the circle are the remnants of a ring cairn. As the group perambulated around the site, it was soon noted that two stones viewed across the circle created a notch that provided a clear visual alignment onto New Craig recumbent stone circle some fields away to the north (at NJ 746 297) - see Jeff Saward's splendid "Spirit of the Ley Hunter" page opposite. One of the stones involved in the alignment has weathered cup marks on it (and we believe we may have detected extremely faint cup marks on the other stone too). And also marks midwinter sunrise when viewed from the centre of the site. Moreover, Loanhead is almost at latitude 57.4 degrees North, which means that this astronomical alignment is reversible to give midsummer sunset directly opposite, marked with another stone on the other side of the ring . This two-way alignment is further reinforced with outlying stones within the overall site area. But subsequent research by Jeff Saward has revealed something further about Loanhead that will explode even the latest statistical ley requirements: a line drawn through New Craig and Loanhead passes through the churchyard in the village of Daviot. More precisely, it passes through the point in the churchyard (NJ 849 282) where it is fortunately still known a recumbent circle stood until 1820 when the minister had the "Druidic circle" pulled down! 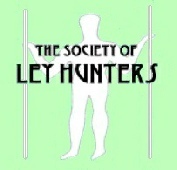 But this ley is only a three-pointer - why will this prove such statistical dynamite? Because these ley markers are the same type of specialised archaeological site, dating from the dame period and the alignment is less than a mile long (1644 yards). The three circles involved in the line all have good lunar alignments from them, and all can indicate the most southerly moonset at minor standstill and the midwinter sunset. Then Loanhead gave us a lesson in natural radiation. Readings within the stone circle averaged at 23 cpm (counts per minute). Readings taken with the geiger counter lodged within the split in the recumbent stone where the radiation count might be expected to be higher (stone is radioactive, especially granitic material) gave only 16.6cpm, 18.6 cpm and 16.7 cpm on successive monitoring sessions. Going out from the circle, background readings obtained were: 25.3 cpm (approximately 50 yards out), 25.6 cpm (about 100 yards), and 28 cpm (about 300 yards). In all, 18 minutes of continuous geiger monitoring. We left the site with a sense of gratitude, knowing more work would have to be done there, and sensing that Gaia has her special places of learning. We found our way to Edinburgh and that journey's end. As we spread out on our separate ways across the globe, many of us felt that new journeys were beginning within each one of us.